Mainline Track exhibited at the southern field days 10th – 12th February. We displayed our full range of rubber tracks, pads, undercarriage parts and Robur attachments including tilt buckets, clamps and hitches. If you came along to see us at Waimumu we take the opportunity to thank you and if you didn’t, we are glad you have taken the time to visit our website. Please browse through the product pages and you will see all the attachments and wearing parts that we had on display at the field days. It was an excellent event and very successful resulting in a number of sales both with dealers and direct to contractors. 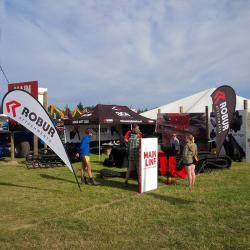 Mainline Track are pleased to be distributers of the Robur brand of attachments and it was good to be able to display these products ‘in the flesh’ where the quality of design and engineering was appreciated by all.